Want to know more about the MBTI personality types? 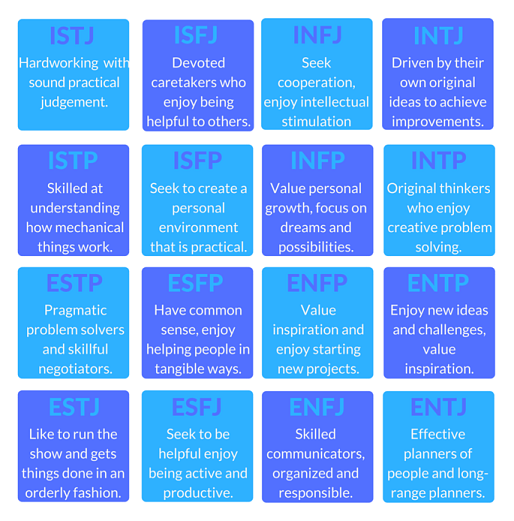 JobTestPrep provides you with information on the sixteen MBTI personality types. We offer a view of what each type is like in a work environment to help familiarize you with the personality types and get the job you apply for. The four polar dimensions are then combined to create sixteen personalities. The personalities contain four different letters, one from each dimension. ISTJs are hard workers. They prefer to work in a structured environment with defined rules. They respect authority and focus on their personal and professional development. Below is a list of some of the strengths and weaknesses ISTJs possess. ISFJs are dedicated and hard workers who believe in good service. They enjoy finding resolutions to day-to-day challenges. Below is a list of some of the strengths and weaknesses ISFJs possess. INFJs need to express their creativity and insight. They must find meaning in their work, in order to know they are helping and connecting with people. Below is a list of some of the strengths and weaknesses INFJs possess. INTJs prefer to work alone, or in small groups. They need to be in an environment with minimal interference. They are creative perfectionists who like to do things their way. Below is a list of some of the strengths and weaknesses INTJs possess. ISTPs often need a sense of unpredictability and excitement. They enjoy working with little space and a hands-on problem to solve. Below is a list of some of the strengths and weaknesses ISTPs possess. ISFPs seek positions where they can do things their own way. They want the ability to express their natural qualities and pursue creative freedom. Below is a list of some of the strengths and weaknesses ISFPs possess. INFPs prefer to work in a face-to-face type of job. They do not do well in stressful environments. Below is a list of some of the strengths and weaknesses INFPs possess. INTPs prefer to work alone. They need to intellectual stimulation, and they are self-driven and good problem solvers. Below is a list of some of the strengths and weaknesses INTPs possess. ESTPs crave immediate results for their efforts. They are curious, energetic people who like action. Below is a list of some of the strengths and weaknesses ESTPs possess. ESFPs like to make the workplace a friendly and enjoyable place. They have a social and relaxed attitude but need to be in an environment with others. Below is a list of some of the strengths and weaknesses ESFPs possess. ENFPs seek a change to explore new ideas and enjoy working with others who share their interests. They have good people skills and need to be in a career where they can push boundaries. Below is a list of some of the strengths and weaknesses ENFPs possess. ENTPs are excellent communicators. People who are ENTPs expect to be heard and need to apply themselves fully to understand and solve the problems that interest them. Below is a list of some of the strengths and weaknesses ENTPs possess. Below is a list of some of the strengths and weaknesses ESTJs possess. ESFJs are well-organized and enjoy bringing order and structure to their workplaces. They often work best in environments with clear, predictable hierarchies and tasks. Below is a list of some of the strengths and weaknesses ESFJs possess. ENFJs are intelligent, warm, creative and social. They enjoy helping others, take an interest in other people and tend to pick up what others want. Below is a list of some of the strengths and weaknesses ENFJ possess. ENTJs prefer to be in a workplace, surrounded by others. They are able to be clear and concise, and they enjoy leadership and responsibility. Below is a list of some of the strengths and weaknesses ENTJs possess. The MBTI personality test helps you identify four basic areas of your personality. These four areas each have a polar dimension. Extroversion describes a person who is energized by others, enjoys a variety of tasks, a quick pace, and is good at multitasking. Introversion describes a person who often likes working alone or in small groups, prefers a more deliberate pace, and likes to focus on one task at a time. Sensing describes are person who is realistic and likes to focus on the facts and details. Such a person would apply common sense and past experience to come up with practical solutions to problems. Intuition type people prefer to focus on possibilities and the big picture. They can easily see patterns, value innovation and seek creative solutions to problems. Thinking type people tend to make decisions using logical analysis, know how to objectively weigh pros and cons, and value honesty, consistency, and fairness. Feeling describes people who tend to be sensitive and cooperative. They base their decisions on their own personal values and how others will be affected by their actions. Judging describes a person who tends to be organized and prepared, likes to make and stick to plans, and is comfortable following most rules. Perceiving type people prefer to keep their options open, like to be able to act spontaneously, and like to be flexible with making plans. It is important to keep in mind that each dimension reveals how a person is most comfortable operating, but it does not mean they will necessarily always possess their assumed dimension. By familiarizing yourself with the strengths and weaknesses of different personality types, you will be able to tailor your answers to the characteristics needed for the job you are applying for. JobTestPrep provides a full report which includes explanations to help you understand your results. Additionally, you will be able to compare and analyze your results to the personality criteria of the actual test.